I don't remember any volume display at the bottom of the screen. Is this specific to the Pixel 3 line? Certainly can't remember anything like that on my Pixel 2 XL. For me it has always slid it on the side of the screen, as if coming from the volume button. It still does now. I'm with you on that , don't recall it being on bottom. I just checked my Pixel 2. Nothing on the bottom of the screen. I just tried this on my Pixel 3 and the action descriptions still show at the bottom. Glad someone else can confirm what I was saying,don’t know why it has disappeared from my screen checked through all the settings cannot see anything regarding this issue. Can you screen shot it , I dont see anything on mine. Yah.. Here's a sample shot. mustang7757 and Coop61 like this. There's a chance that toast message is being pushed by a third party app that you downloaded and not by the system. You can try this app if you want to be sure. We talked about this app on this other thread. Yeah, not seeing on my Xl either. However, I do recall seeing this at one point now that I see the screenshot. umm.. maybe. I don't have many 3rd party apps on system. I run a fairly skinny device, but anything's possible. I just think it's a service side thing .. I mean... it's Google, right. We might all wake up tomorrow and either all have it or nobody have it..
Really dont remember seeing it probably it was there didn't notice, but definitely not there now. Most likely this a system notification but funny that it could be different between the 3 and 3XL models. Yeah its weird that both wouldn't have it. Is it perhaps something to do with having the Gesture interface turned on vs off? Or perhaps it's the setup with the Gesture interface turned on AND the Accessibility thingie enabled? 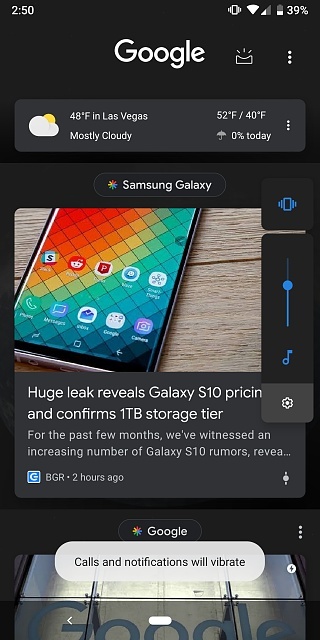 Pixel 3 can't disable gestures on pix 2 you can. Yep I miss those little message balloons all the time, they seem to blend into the screen lol. I honestly don't remember if I've ever seen that or not. Why does my phone show notifications for every day this month except 2 of those days?